We have returned to the Costa Brava to squeeze one more week out of Spain before we cross the border back into France. We opted to stay at Camping Les Medes, a site that was recommended to us by fellow travellers and bloggers, Peter and Nia. It is on the outskirts of Estartit, quietly positioned amongst fields and we love it. At this time of year the vast majority of visitors are mature adults making the most of the quiet and the reasonable prices of the low season. It is part of the ACSI scheme that gives massive discounts to members for out of season breaks. We had plenty of choice of pitches and the whole place is laid out so that half of each row is in sunshine and half in shade. In February you can guess which are the most popular. Our only challenge was finding one that was big enough for our van. There are trees on each pitch and we had to be very careful about the available height as well as length. It took us a fair few shuffles backwards and forwards to get onto the pitch and despite our best efforts we are still at an angle. Fortunately it’s a corner pitch so we still have room to sit outside in the sun. We were embarrassed at first about the amount of manoeuvring it took, not to mention the smell of burning clutch wafting around the site, until we saw other people doing the same thing. It’s the one thing that’s not so great about this site. No doubt the trees were planted and the pitches created before people started buying big motorhomes. Small caravans and tents have no problem at all. Once on the pitch we breathed out and set about the very serious business of having a relaxing time here. We are within easy walking distance of the beach and an easy cycle from Lidl’s. These two things alone are enough to make us happy, simple souls that we are. It is a little further on the bikes to Torroella de Montgri but well worth the trip, especially on market day. 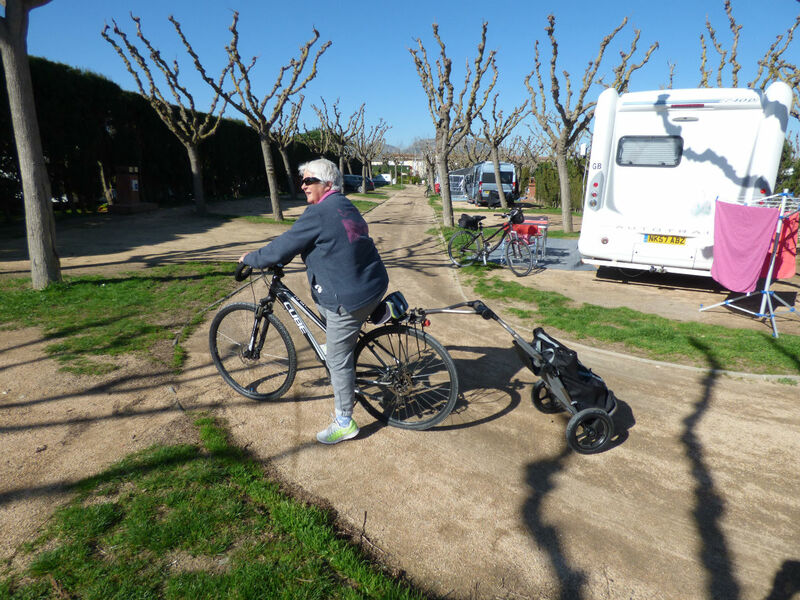 We cycled there this morning with Shirley’s bike trolley attached and stocked up with fruit and vegetables. We are so going to miss all this lovely fresh produce when we get home. The site has an indoor swimming pool, boules pitch and, joy of joys, a tennis court. Since we played padel at Marjal we have been talking about taking up tennis again. Neither of us has played it since we were about fifteen but we are keen badminton players so we reckoned we should be able to manage. The use of the court complete with racquets and balls is completely free of charge here, as long as you don’t want to play at night and use the big flood lights. We are naturally reluctant to be lit up in the middle of the site for all to see while we make a pig’s ear of a game of tennis so we play when everyone else is having a siesta, otherwise known as a granny nap. Compared with padel and badminton, tennis turned out to be more of a challenge than we’d hoped. In Padel you only have to serve into the correct quadrant of the court and after that you can hit the ball anywhere you like as long as it goes over the net and bounces before it hits a wall, or your opponent’s bat, or indeed your opponent. In badminton the racquet and shuttle are both light and the court is smaller, something I will now appreciate much more than I did before trying this tennis lark. Feeling the weight of the tennis racquet and seeing down the length of the court I knew we were in for a rough time. An hour later we were dripping with sweat and we each had one arm longer than the other. We had lost a ball right through the fencing that went round the court and then another right over the top. Several words of the four letter variety had inadvertently slipped out of our mouths along with quite a lot of grunts. Now I understand all the grunting at Wimbledon. I used to wonder why they couldn’t just hit the thing without making noises like a pig in labour but now I appreciate the difficulty. The noises come out whether you want them to or not. Sometimes, with all the exertion, the noises come out of both ends. It’s really not the elegant game we had imagined. We’ve played two games and now I’m having some difficulty walking. Hopefully this will improve with practice. My obsession has not left me yet. We have gone from ‘the batteries are definitely coming back to life’ to ‘the batteries are definitely totally finished’ and every version of that in between. The current thinking is this – ‘one battery is done for and the other might be ok’. I found a rather nifty four stage battery charger in Lidl’s (where else?) and attached it first to one battery then to the other, having unhooked the relay between the two of them first – see I’ve been learning some of the language of batteries, but not much else. One battery took a good charge and the other didn’t. This seemed to be meaningful so this morning I have disconnected and removed the one that wouldn’t take a decent charge and reconnected the other one. Only time will tell whether this will get us back to the UK where batteries are easy to source and we can get someone to put them in for us. Those babies weigh an absolute ton, especially when you have to get them into an under seat locker. There are distinct slurping noises coming from under the seat – oh no, wait a minute, that’s Poppy having a drink of water. I remain hopeful, if obsessed. Shirley helped me lift the battery out and then went back to her book with a sigh. Just as I was writing this a terrible smell of burning filled the van and I had a little panic but it was ok, it was a farmer burning something unspeakable. Speaking of something unspeakable, Shirley discovered a poster when she was out on a dog walk that describes something so bizarre you could not make it up. Apparently there is a local custom here to put a statue into the Christmas crib that is an image of a man taking a dump. Honestly – this is true! It is supposed to bring wealth, happiness and fertility. How this idea came into being is almost impossible to imagine. Man deposits human excrement beside baby’s crib and everyone agreed that their lives were transformed? Very, very peculiar. So you can buy one of these statues from a local pottery – er… no thanks. A picture paints a thousand words – or one. That must be a smile of relief after the “jolly little man” got rid of that! What a weird custom!! He looks like he feels a lot better without it! It’s the strangest Christmas decoration we’ve ever seen.